I recently had a few people ask me how I make my sourdough bread, so thought I’d just post about it and then just send them here to read it. That’s one way to get some traffic to my blog! Almost 25 years ago I had bought some starter from Jedediah’s in Jackson Hole. I didn’t realize you had to keep feeding it and it died pretty quickly. Over the years I’ve tried to make my own starter from potatoes or whole wheat with dismal results. Finally, last year I discovered Cultures for Health, which has become a great resource for me. I’ve bought other fermenting cultures from them and their live chat support is unbeatable! I bought their San Francisco Sourdough Starter and have been trying various recipes, hoping to find one that I could follow time after time and have reasonably reliable results. What’s so special about sourdough bread? 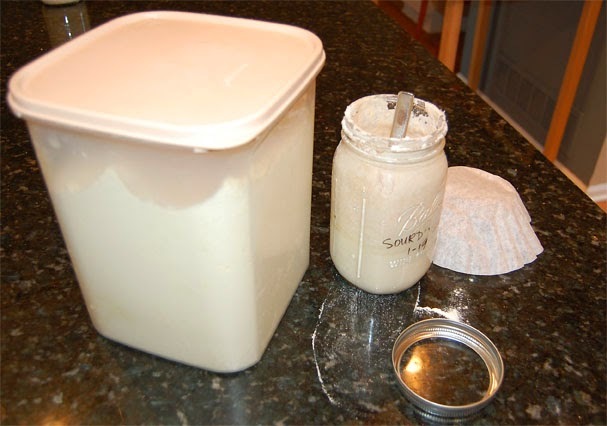 Sourdough starters typically contain acid resistant wild yeast and a host of lactobacillus bacteria. Lactobacillus bacteria are responsible for the sour taste in sourdough. The acid produced by lactobacillus lowers the pH of the dough, which in turn makes it a more hostile environment for other types of bacteria resulting in a longer shelf life—sourdough bread doesn’t get stale as quickly as commercial yeast breads. Also, the sourdough pre-digests gluten and other proteins in flour, making them easier for us to digest. People with gluten sensitivity may not react to sourdough. More information about sourdough, compared to it’s less natural cousin commercial yeast, can be found in this Weston Price article. Now before I get started, be forewarned that since sourdough is a living organism, many things can affect the outcome of the bread. Temperature and humidity are the biggest challenges I’ve had, as the bread will ferment and rise quickly in a warm kitchen, too fast in a hot kitchen and dreadfully slow when it’s cool. Also, flour measurements are estimates only! When I moved to Colorado from Florida I quickly realized that the moisture content in flour varied drastically! If I used the same amount of flour called for in a recipe that worked in Florida, here in Colorado it would make a dry, hard loaf because the flour itself was much drier. So use your instincts, become one with your dough, and all will be well Grasshopper. You can download a PDF of the sourdough recipe and instructions here. What you will end up with: Two gorgeous, delicious loaves of possibly the best bread you’ll ever eat. Day 1 – Feed (activate) the starter that has been dormant in your refrigerator. Day 2 – The first rise, 3-4 hours. Then add other ingredients, knead until ready, separate into two loaves. 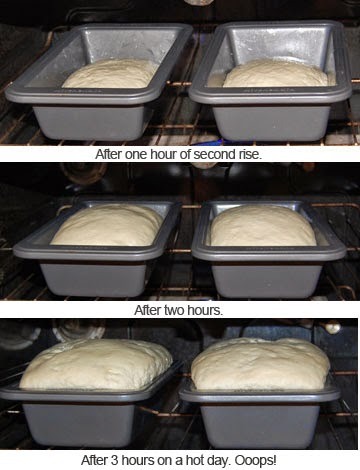 Second rise, 2-4 hours. Bake 40 mins at 375°. Eat. 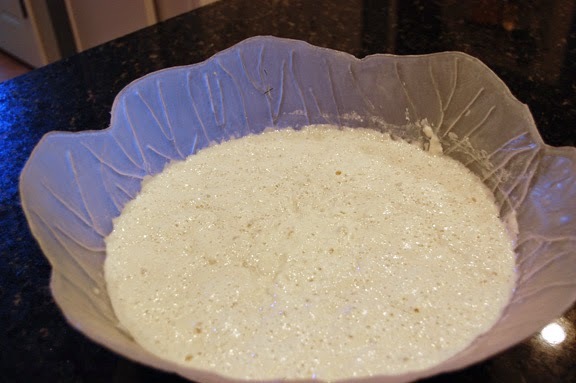 Put about 1 cup (or more) of your sourdough starter in a large bowl and feed 1/2 c flour, 1/2 water every 3-4 hours. You should feed a minimum of 3 times, 4 is even better, before attempting to make bread. More info here: Feeding Sourdough for a Batch of Bread. Bubbling starter in my favorite bowl. Add 2 cups of flour and enough water to starter to make a thick slurry, the consistency being between brownie and pancake batter. Let sit loosely covered, in a warm place until it doubles in size and bubbles, about 3-4 hours. Add the other ingredients to the starter and mix in by hand. Then start adding flour, 1/2 cup at a time, until it can no longer by mixed by hand. This should be after adding 1-1/2 to 2 cups. 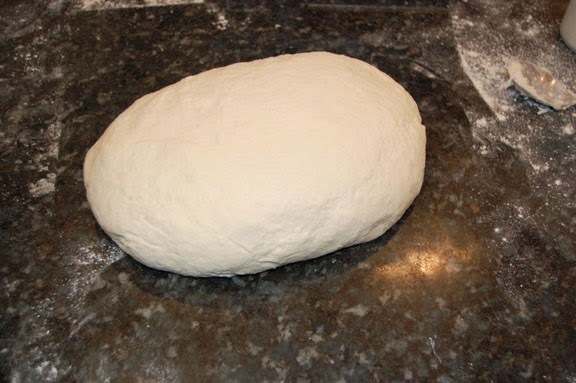 Dump the dough onto a floured counter or other smooth surface and start kneading in flour a small handful at a time. I have a stainless Graham Kerr/ Galloping Gourmet pastry scraper which helps with this process, as well as with cleaning dough off the counter during cleanup. Keep adding flour until the dough barely sticks to the surface. Don’t add too much, it should be as soft as possible. Knead dough for 10 minutes or so, then do the windowpane test (see my video below). If it doesn’t pass the test, knead for another five minutes and repeat the test. Keep doing this until your dough gets a passing grade. Let dough sit for a few minutes while you butter the pans. Cut the dough in half (you can weigh it if you feel the need), knead each loaf for a minute or two to get a nice smooth shape. Place in buttered pans, smooth some more butter on the top to keep it from drying out. You can sprinkle some Asiago on the top if you like. Place in a warm place (again, my oven) and let it rise for 3-4 hours, until it’s just above the pan edges. 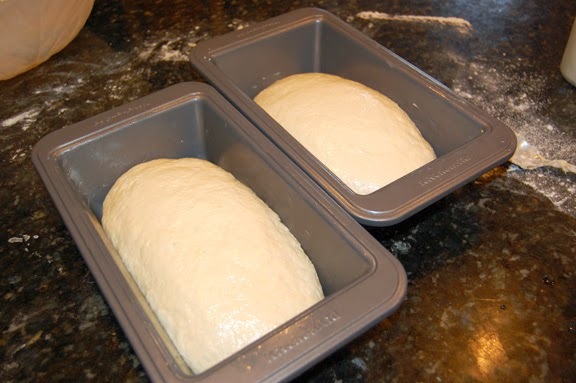 Place bread pans in oven, turn oven on to 375° and once the oven tells you it’s reached the right temperature, bake for 40 minutes or until bread is brown and sounds hollow if you tap on the surface. Remove to a rack and cool for about 10 minutes. Dump bread out of the pans and leave on rack to cool. They may have sweated in the pans, you just want to dry them out evenly. 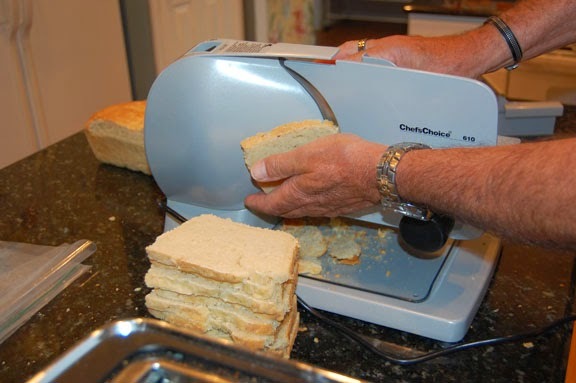 Once completely cooled, the bread can be sliced and frozen. We bought this meat slicer recently, as a friend in Europe sends us organic cured meats every year, but it has turned out to be a fantastic bread slicer! Learning Opportunity: I was photographing my most recent bread for this post. It was an extremely hot day, we didn’t get the air conditioner going and I was working on a DIY home repair project that took most of my attention outdoors. So sadly I let the bread rise too much. That caused the bread to “collapse” during baking, so the beautifully rounded bread at the left ended up flattening out a little in the oven. It’s not picture perfect, but I decided to proceed with this post as is to demonstrate that sourdough bread is extremely forgiving. It wasn’t as pretty as it could have been, but the texture and density of the loaves were still gorgeous and the flavor is fabulous. I’ve even undercooked my bread once, put it back in the oven 15 minutes later and baked an extra 15 minutes and the loaves were great! I have to say, if you make this bread with rosemary and asiago cheese it will make your kitchen smell like freshly baked bread every time you toast it. Please do it justice and slather it with a high quality butter, such as Kerry Gold, and you will be in bread heaven. One of the hardest things about making bread is cleaning the bowl. 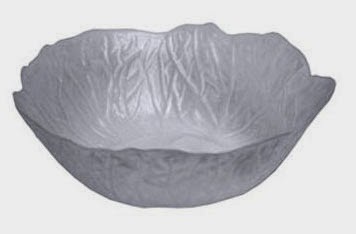 I bought two of these really cheap, flexible plastic 6 quart salad bowls at a party store about ten years ago. They look like cabbage leaves made into a bowl, and have been the best bowls for a LOT of things. For sourdough cleanup, I just leave the dirty bowl on the counter over night, until the dough dries out. Next day I just have to flex the bowl and most of the dough just flakes off. I pour that in the trash, and use a dry veggie brush to scrape off the remaining bits of dough. Whatever is left behind, I wash with soap and water. That prevents me from (1) clogging up a sponge with dough, (2) clogging up the kitchen sink drain and (3) fighting with fresh, gluey dough. These bowls have been the best ones for mixing salads, making sauerkraut and other fermented veggies. Very little investment and yet priceless! Another Note: You can use your sourdough started for more recipes than just bread, such as crackers, pancakes, pizza dough. Check out this Cultures for Health page. You can also dehydrate and the freeze some of your starter, so if you ever have an oops and kill your starter, you’ll have a backup in the freezer. Windowpane test: Stretching a piece of bread dough to see if it’s done being kneaded. You should be able to stretch the dough to the point where you start to see light through it. If it breaks rather than stretching, you should knead for five minutes more and try again. In a week or so I’ll be experimenting again, by using mostly freshly ground Einkorn flour. There’s a lot of good buzz about Einkorn out there, it sounds pretty exciting! 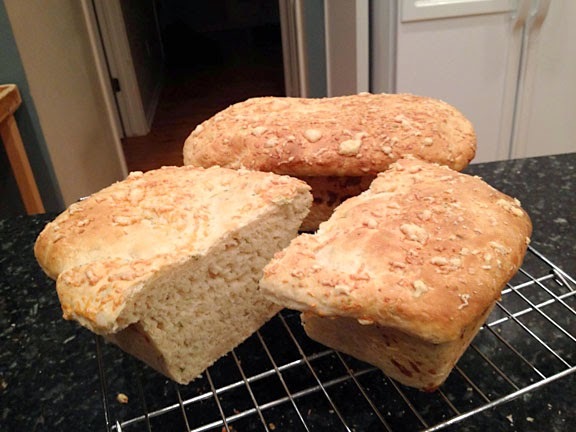 This entry was posted in baking bread, making sourdough bread, natural yeast, sourdough bread recipe, sourdough recipe, windowpane test, yeastless bread on July 23, 2014 by Farmer Deb.